Above - A Google StreetView Image of the former Embassy Theatre, High Holborn, today a branch of HSBC - Click to Interact. An image of the building whilst in use as the Holborn Cinema, and some historical details, can be found here. 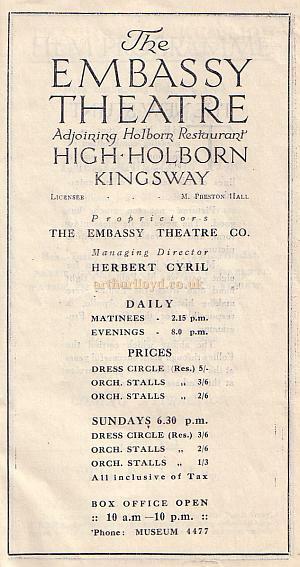 The Embassy Theatre was situated in High Holborn, two doors down from the Holborn Restaurant, which was on the corner of Kingsway and High Holborn. The Theatre was a conversion of the earlier Holborn Cinema and the reconstruction was carried out for its Director, Herbert Cyril, to the designs of the well known Theatre Architect Frank Verity. The Theatre, which had a capacity of 403, opened with a production of 'The New Stunt', a variety show with moving pictures, on Monday the 24th of September 1923. The earlier Holborn Cinema, which the Embassy Theatre replaced, seated slightly less than 500 and had a tea lounge on its first floor and first opened on the 15th of October 1910. It was designed by F. W. Foster for Holborn Cinemas Ltd. But the conversion by Frank Verity in 1923 allowed live variety shows to accompany the film presentations. 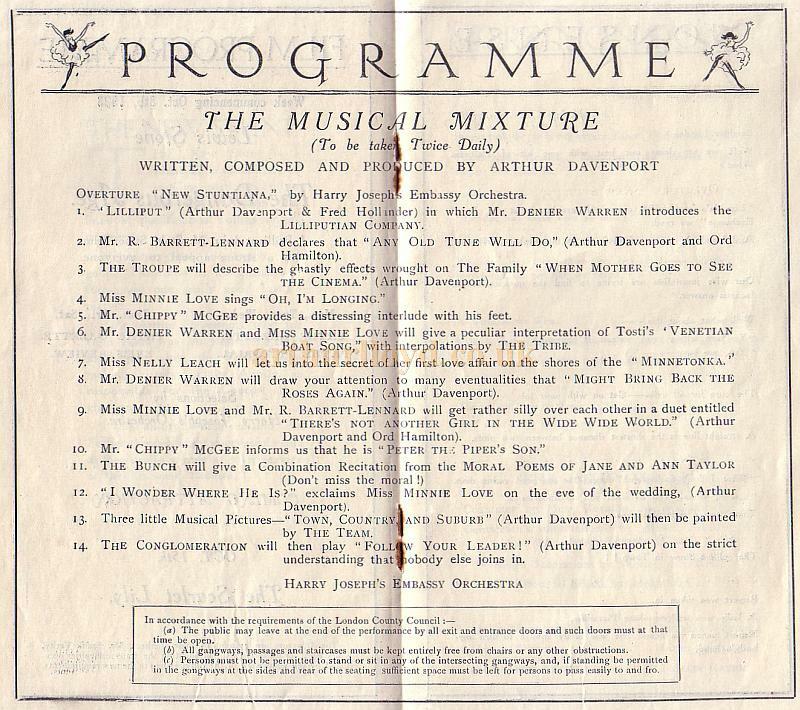 Right - A programme for 'The New Stunt', which was the opening production at the Embassy Theatre, Holborn on the 24th of September 1923 - More details from this programme can be seen below. Right - An Advertisement for 'The New Stunt' which was the opening production at the Embassy Theatre, Holborn - From the Pall Mall Gazette, Tuesday the 18th of September 1923. The Bioscope reported on the new Embassy Theatre in their 27th of September 1923 edition saying:- 'The first instance of a cinema management exercising the full music and dancing licence granted by the London County Council is afforded in the opening of the Embassy Theatre' Hitherto known as the Holborn Cinema, the building has been reconstructed and, in the words of the requirement of the London County Council regulations, provides "adequate dressing-rooms and accommodation for performers and members of the orchestra." 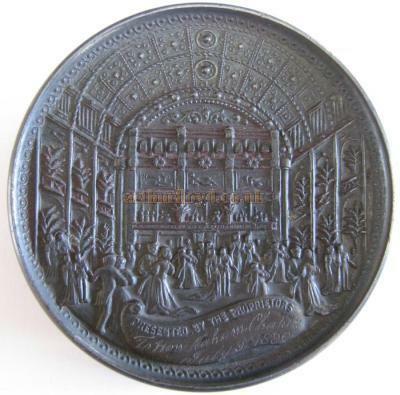 The management, of which Mr. Herbert Cyril is head, with Mr, Reginald Wood as acting manager, are thereby enabled to introduce song and dance, and to this end revues and song scenas will be introduced. Films, however, will still be a prominent feature of the Programme. The management have entered into a contract with the First National whereby first-runs have been secured. Pathe's "Eve" film is also being screened. The building reconstructions have been carried out by A. E. Saxbey and Co., of Islingston, to the plans of Mr. Frank Verity, F.R.I.B.A. Accommodation has been provided for 403 seats, comfortable tip-up chairs, with an uninterrupted view of the screen and stage from the ground level and balcony. Messrs. Waring and Gillow have been responsible for the furnishing, decorations, etc. New cinematograph apparatus has been installed, including Ross machines. The orchestra is under the baton of Mr. Harry Josephs. It is proposed to run afternoon and evening performances (with Sunday shows at reduced prices). The star film will be shown for the full week. The prices of admission are 5s and 3s, 6d. for reserved seats, and 2s, 6d. for unreserved stalls, all including tax. The above text in quotes was first published in the Bioscope, 27th of September 1923. 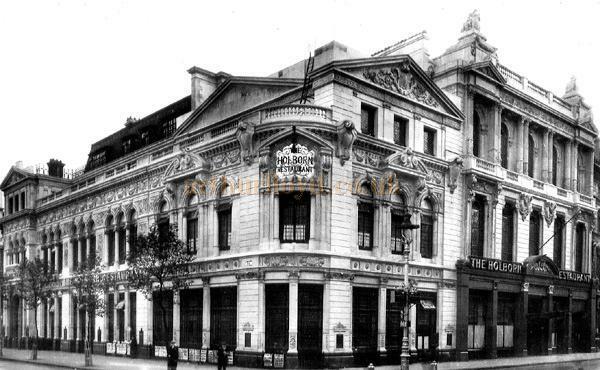 The Illustrated London News also reported on the new Embassy Theatre, in their 6th of October 1923 edition, saying:- 'At last London has one of those dear little "boites" for which we envy Paris. While others have been beating about the bush to find a place for "a long-felt want," Mr. Herbert Cyril has snared the bird. He found next door to the Holborn Restaurant a little cinema that probably suffered from the competition of the greater theatres. He acquired it, and with taste and acumen he turned it into a band-box playhouse. 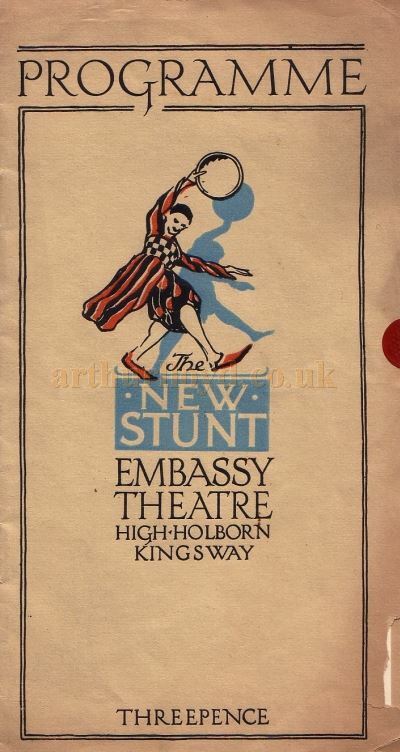 Right - A page from the Programme for 'The New Stunt', the opening production at the Embassy Theatre, High Holborn on the 24th of September 1923. The Embassy Theatre, Holborn, is now the smallest but the prettiest in London: it has but some four hundred seats, all stalls and balcony - cosy, roomy, and every one of them in full view of the stage, a charming Chinese scheme of blue curtains with two little pagodas as wings. The entertainment, at prices for all purses - 5s. maximum, 2s. 6d. minimum, no tax - is at present a pleasant medley of cinema and a kind of Follies Entertainment under the safe guidance of that practised old hand, Arthur Davenport, Pelissier's chief lieutenant in happy days. The leader of the troupe is clever Dennis Warren, minstrel, humourist, diseur, master of dialects; and he, with two ladies and two henchmen, works like a Trojan to make merriment. The above text in quotes was first published in the the ILN, 6th of October 1923. The Yorkshire Post and Leeds Intelligencer also reported on the opening of the Embassy Theatre, in their 25th of September 1923 edition, saying:- 'The Cinema, in its all-conquering career, has devastated many suburban theatres, and driven many music hall people in West London into a bitter realisation of the maxim, "Shadows we are, and shadows we pursue." London's leading music halls have passed, or seem all about to pass, through the valley of the shadow. Above - A page from the Programme for 'The New Stunt', the opening production at the Embassy Theatre, High Holborn on the 24th of September 1923. ...We had about half-an-hour of pictures first, and noted with pleasure that, when Mr. Bruce Baitisfather goes sketching in the woods, his wife comes to take him home in a Rolls Royce, whereas many equally deserving artists have to be satisfied with a two-seater, or even as "push-bike." We also learned that the birds on Penguin Island have a good deal to learn from politicians about confident camera deportment. Pictures of a more serious character wound up the evening. The jam in the sandwich was a very lively vaudeville show which lasted for about ninety minutes, without any break except the applause of the audience and frequent encores. Mr. Arthur Davidson, described on the programme as Pellissier's right-hand man for eight years, was responsible as author for a large part of the programme. The little travesties songs and dances were carried through by a company of five - Mr. Dernier Warren, who acted also as misoneur. Mr. R. Barrett Lennard, Miss Nellie Leach, Miss Minnie Love, and Mr. Chippy McGee, whose eccentric dances lost nothing through his Eton College uniform. Many of the others were very amusing, particularly as rendering of Tosti's 'Venetian Boat Song," interrupted by a serous discussion between Mr. Warren and Miss Love of the true interpretation of the words. "The city sleeps, and well he keeps Her watch the gentle moon," in the course of which it was pointed out that it was doubtful whether the moon could have much use for a watch, and that it need not be carefully kept from anybody, as the Man in the Moon would have no place to pawn it - and so on. The cinema audience took a little time to settle down to anything so frivolous, but soon welcomed the "musical mixture" uproariously. The above text in quotes was first published in the Yorkshire Post and Leeds Intelligencer, 25th of September 1923. Despite the glowing and hopeful reviews of the new Embassy Theatre, and its opening production, shown above, the Theatre was not the success the reviewers, or indeed the management, had hoped for, and the Theatre was soon back in use as a full time Cinema under the management of New ERA Films. The Bioscope of the 6th of December 1923 reported on this saying that:- 'An experiment which will be of interest to all exhibitors is to be initiated at the Embassy Theatre, Holborn, next week, by New Era Films, who have taken over this theatre for the purpose of showing an all-shorts programme.' And that:- 'It is the intention of New Era Films to show only the cream of the shorts, so that the exhibition of any short film at the Embassy will become a real hall-mark of merit.' - The Bioscope, 6th of December 1923, courtesy Jo Botting. 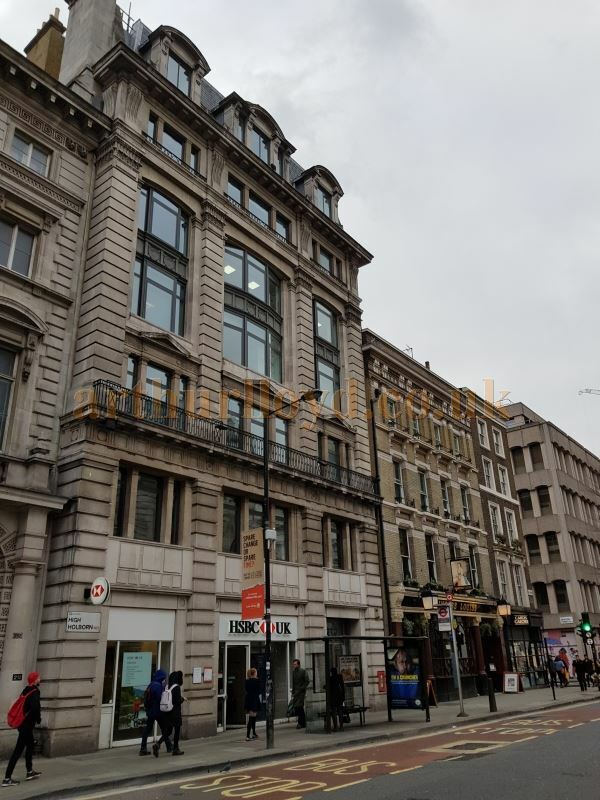 Right - The former Embassy Theatre, High Holborn, in a photo taken in January 2019, today a branch of HSBC. 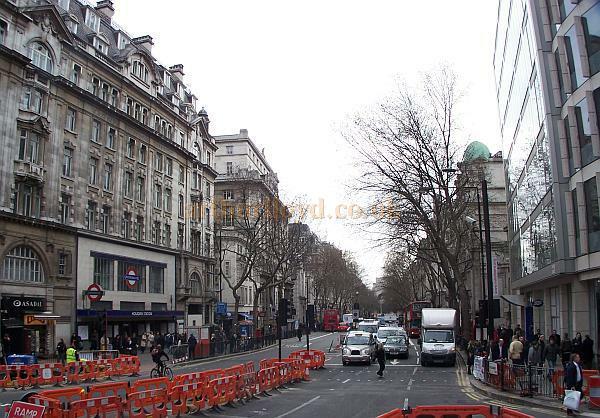 An image of the building whilst in use as the Holborn Cinema, and some historical details, can be found here. 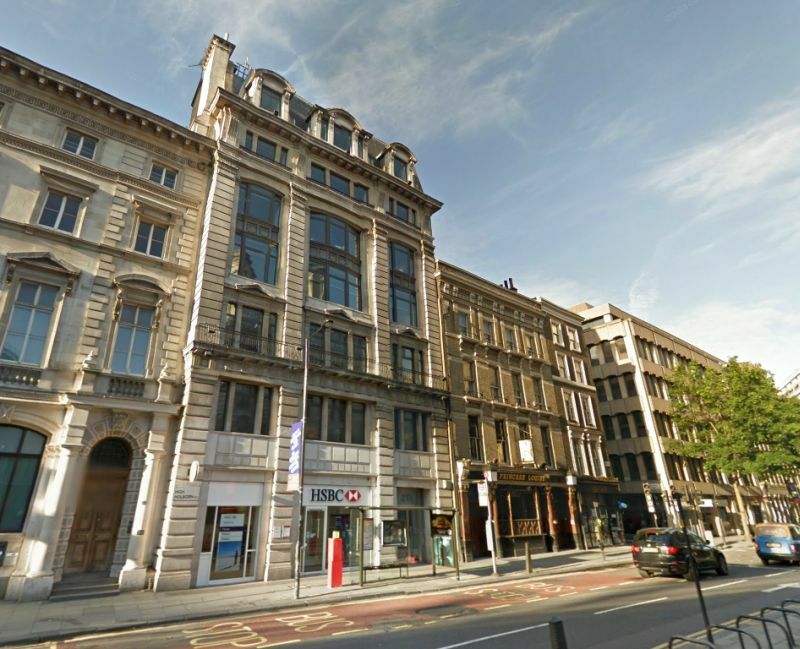 By 1925 the building was in use as a factory for casting metal casements, and would later become a branch of the Midland Bank with offices above, today it is in use as a branch of HSBC, see image top of page. An image of the building whilst in use as the Holborn Cinema, and some historical details, can be found here. If you have any more information or images for the Embassy Theatre or Holborn Cinema that you are willing to share, please Contact me. The Holborn Restaurant is at the corner of Kingsway (the new route to the Strand) and opposite here is Southampton-row, which, leading to Russell-sq, has become a great centre for hotels and boarding-houses of different styles (temperance as well as others) suitable to middle-class visitors - Charles Dickens Jr. et al, Dickens Dictionary of London, c.1908. Right - Notice of a Freemason's meeting at the Masonic Hall above the Holborn Restaurant, sent to Alan Bailey's father in 1934 - Courtesy Alan Bailey. A visitor to the site, Alan Bailey' has recently sent in some information and images for the Holborn Restaurant, he writes: 'My Mother in her teens (now sadly departed) worked at the Holborn Restaurant as a Waitress, she remembered encounters with The Western Brothers and other artistes of the day who appeared there. 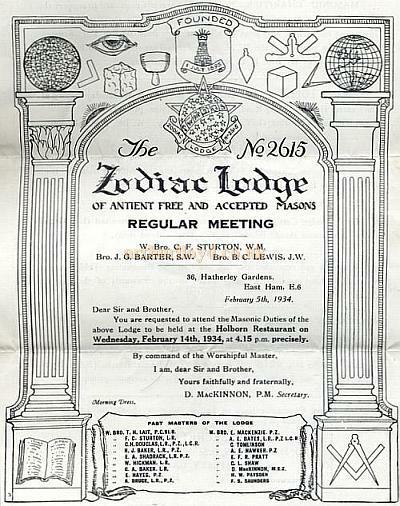 Above the Restaurant was a Masonic Hall where my father was a Mason and that's how they met. 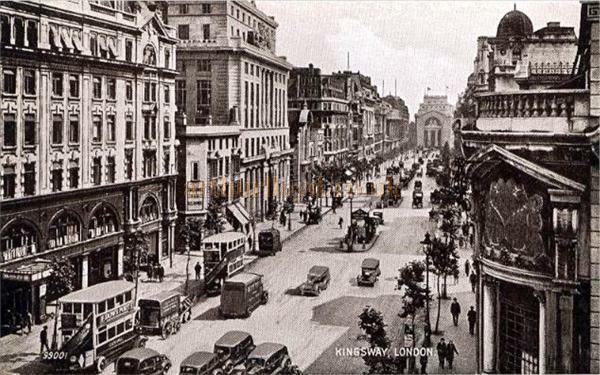 I have a postcard photo of the building in those days and a 'Mappin & Webb' silver tankard with the Restaurant monogram on it, also a book of matches with same.' - Alan Bailey. 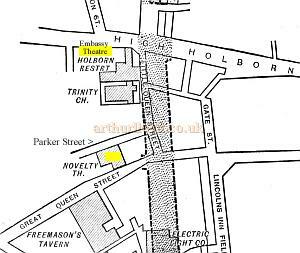 The Holborn Restaurant was a very large building which was popular with clubs and societies. The British Chess Federation was founded there in 1904 and when in 1908 the Olympic Games were held in London, a series of banquets were given at the restaurant for the participating athletes. The Restaurant was also a popular venue for Masonic meetings and, like many hotels and restaurants in London at that time, the premise contained a specially built Masonic temple. The Holborn Restaurant was closed in 1954 and converted into offices. Right - A Matchbook from the Holborn Restaurant - Courtesy Alan Bailey. 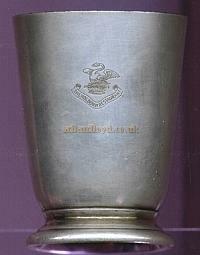 Left - A Monogrammed tankard bearing the words 'Holborn Restaurant - Courtesy Alan Bailey. 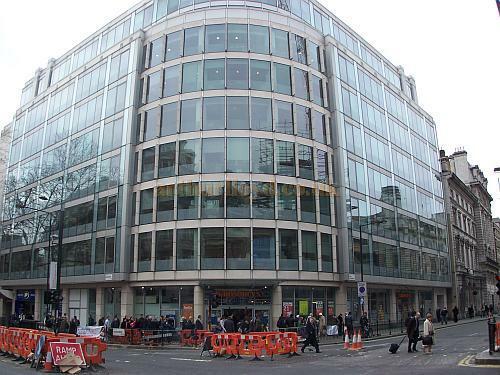 Since the conversion into offices The Holborn Restaurant building has been entirely demolished and a large modern building, including a Sainsbury's Supermarket, stands on the site. Above - Photograph showing Kingsway in 2008 from the same position as the postcard above, albeit at a lower angle. The Holborn Restaurant has been replaced by a new building housing shops and offices, just visible to the right of the image. - Photo M.L. 2008. Above - The building currently on the site of the former Holborn Restaurant, High Holborn and Kingsway in 2008 - Photo M.L. 'The Ancient and Honourable Artillery Company of Massachusetts last night give a banquet at the King's Hail, Holborn Restaurant, which was attended by a numerous company. The banquet was given in compliment to the Honourable Artillery Company of London. Colonel Henry Walker presided, and among those present were  the Prince of Wales, the Duke of Connaught, the Lord Chancellor, the Hon. T. F. Bayard (American Minister), the Marquis of Lansdowne, the Earl of Denbigh, the Bishop of Marlborough, the Hon. P. A. Collins (Consul-General, U.S.A.), Viscount de Vesci, General Sir H. E. Wood, Lord Colville of Culross, General Lord Methven. General Sir Redvers Buller, Major-General Field-Marshal Sir Donald Stewart, Geoeral Ellis. Sir Henry Irving, Sir Charles Hall, Sir Donald A. Smith, &c.
The Hall was decorated with the national flags of England and the United States. Dinner being over, the Chairman rose, amid cheers, to propose the toast of " The Queen." Having first welcomed the Prince of Wales to the Gathering, he said they of the Ancient and Honourable Artillery Company stood that night on British soil; it was their Fatherland, and they had not forgotten it. (Cheers.) The glorious history of this empire was never brighter than in the last three score years, when it had won the respect of the world and had seen a career of prosperity, extension of power, and increase of wealth never paralleled in her history. Her Majesty, whose queenliness as a woman, whose womanliness as a Queen, had for three-score years clothed both throne and home with purity, dignity, and honour, had won the respect and admiration of the world  (loud cheers)  and her words and counsels had ever been for peace between the two great Anglo-Saxon people. (Renewed cheers.) They tendered her their sincerest thanks for her gracious act of yesterday, in which they all took so much pride, and he knew all of them would respond most heartily to the toast of the health of the Queen. (Loud cheers.) The toast was enthusiastically honoured. The Prince of Wales then rose, and was greeted with prolonged cheering. He said  Colonel Walker and gentlemen, the privilege is now afforded to me to propose the next toast. Before I do so, I am anxious to express to Colonel Walker how deeply touched I have been with the kind terms in which he proposed the Queen's health. Holding the position I do as the Queen's senior subject, I feel sure I may say with all my other fellow-subjects of the Queen, how grateful we are for the kind way in which this toast has been proposed. (Cheers.) I know how grateful the Queen has been to see you, Colonel Walker, and your distinguished corps at Windsor  (hear, hear)  and that the same feeling's animate her as they do me in our strong liking and affection for your great country. (Cheers.) It is a long time, I regret to say, since I was last in America. I have not forgotten the reception I met with on that occasion, nor do I forget President Buchanan, and how kindly he received me when I went to Washington. It is now my privilege to propose the health of his successor, your President. (Cheers.) I give you the health of the President of the United States. The toast having been duly honoured, three cheers, led by His Royal Highness were given for the President.' - Glasgow Herald, 10th July 1896. 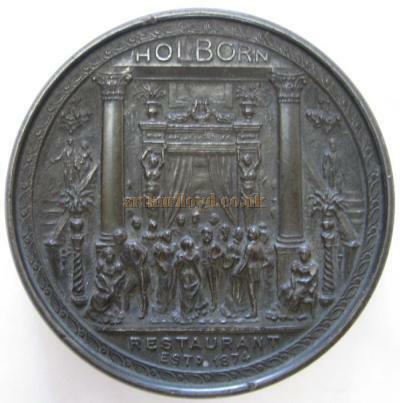 Above - The insignia on the medallion from the Holborn Restaurant which was presented to the Hon Nahum Chapin in July 1896 - Courtesy Ron Cheek.